The Inner-Western Sydney suburb of Marrickville lies seven kilometres southwest of Sydney’s central business district. It is the largest suburb in the local government area of Marrickville Council, and is surrounded by the neighbouring suburbs of Earlwood, Tempe, Dulwich Hill, Sydenham, Newtown, Enmore, St Peters, Stanmore, Petersham, and Hurlstone Park. The Cooks River passes to the south of Marrickville. Marrickville is a suburb reflecting diversity in residential, commercial, and industrial precincts. It has, in recent years, become a highly sought after place to live, with a bohemian vibe. Red Bin – weekly collection of general rubbish, including nappies, food scraps, plastic bags, broken ceramics, mirrors, and Pyrex, and non-recyclables. Never place oils, liquids, soils, building materials, paints, solvents, computers, chemicals, syringes, batteries, or recyclables in the red bin. Green Bin – collected fortnightly, the green bin is for leaves, twigs, grass clippings, flowers, and small branches. It should not be used for soils, plastics, tree stumps, rocks, food waste, recyclables, or general garbage. Yellow Bin – again collected fortnightly, this is for recyclables, including clear glass, steel cans, aluminium cans, empty aerosol cans, plastic containers, paper, cardboard, paper, milk cartons, pizza boxes, aluminium foil, and pots and pans. Never put food scraps, plastic bags or wrap, polystyrene, nappies, clothing, CDs or DVDs, flower pots, ceramics, sharps, medical waste, green waste or photographs in the recycling bin. Batteries and mobile phones can be recycled at the Marrickville Council Administration building in Petersham, or at e-waste drop-off days. SITA provides information for asbestos disposal for Marrickville residents. Needles, syringes and lancets may be disposed of safely in a range of Marrickville pharmacies; there is also a Needle Cleanup Hotline for reporting sharps in public places. Fridge Buyback is a program which encourages residents to surrender their second fridge or freezer. Donation points: including The Bower Reuse and Repair Centre, Reverse Garbage, Freecycle, and various charity organisations. According to the council, Marrickville residents are currently recycling half the rubbish they generate annually. For a simple, single, same day service for all non-hazardous forms of Marrickville rubbish removal, call Andrew at AA Adonis Rubbish Removals to remove your unwanted trash, recycling, and donatable items. There is no need to take your rubbish anywhere, no need to wait for a specific date, to sort it or to even place your unwanted goods kerbside. Our professional and friendly team come to your door and do all the hard work for you. 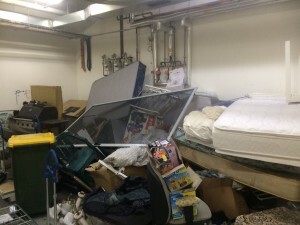 There is no better way to deal with rubbish removal in Marrickville than with us.